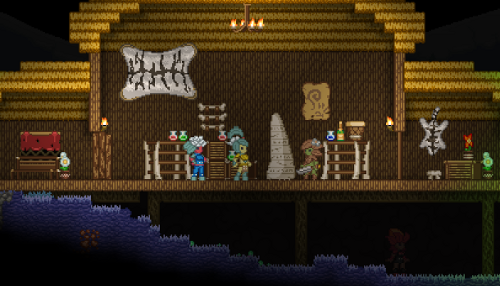 Starbound is an upcoming indie sandbox game designed to be something of a spiritual successor to Terraria. It's filled with all the exploration, building, crafting and character customization features you could ever want, but the real kicker is the addition of randomly generated planets you can inhabit! It's a good thing, too, as your home world was just destroyed by something evil, so you'll need all the space and resources you can get to construct a gigantic death laser of revenge. The pre-ordering system is structured like a Kickstarter program and features tiers offering better rewards at higher prices. The most basic package is the $15 Pixel Tier that includes the game, an invite to the beta when it begins, and the soundtrack. The most expensive package is the Impervium Tier weighing in at $2,000 that gives you all the above along with your name in the credits, a special forum badge, your name in the NPC generator, and a custom statue of yourself placed in the game. Expensive, but pre-dibs on the Hero of Canton pose. Co-op has been confirmed for Starbound, though most other gameplay details are still under wraps. It's scheduled to release before the end of the year for PC, Mac and Linux. Page created in 0.2837 seconds.